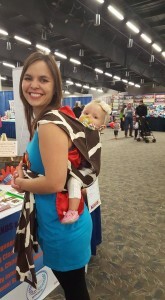 I have been at my booth at the Saskatoon Family Expo today and will be there tomorrow as well! We are offering a lot of specials and information giving. Here I am having fun playing with a family’s new Mei Tai! Isn’t it beautiful?! Come down and say Hello! I want to try your beauties too! « Join Us Tomorrow at the Saskatoon Family Expo!